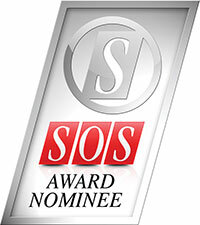 For more information about Acou6tics, visit Vir2 Instruments. "9/10! 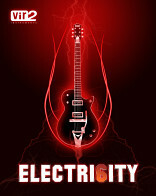 As Electri6ity users would expect, the sound is pretty much flawless...a thing of beauty." 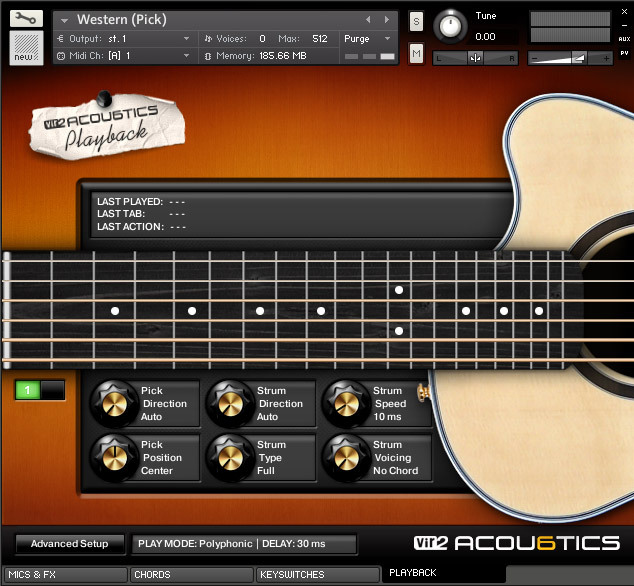 Following in the footsteps of Vir2 Instruments' award-winning Electri6ity electric guitar virtual instrument, Acou6tics applies the same advanced technologies to re-imagine the virtual acoustic guitar. 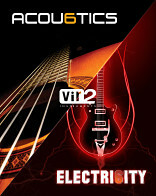 Vir2 has meticulously recorded six different acoustic instruments: a steel-string guitar, twelve-string, nylon string, ukulele, mandolin, and guitalele, and presents them in astonishing detail. 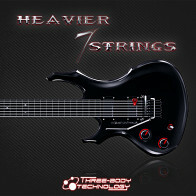 It features both plectrum and finger picking, and Blumlein stereo recordings alongside the piezo pickup perspective. 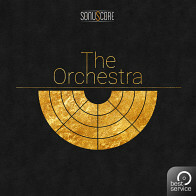 Thousands of samples across more than a dozen articulations were recorded for each instrument, including sustains, mutes, releases, legatos, hammer-ons and pull-offs, slides, harmonics, and effects. 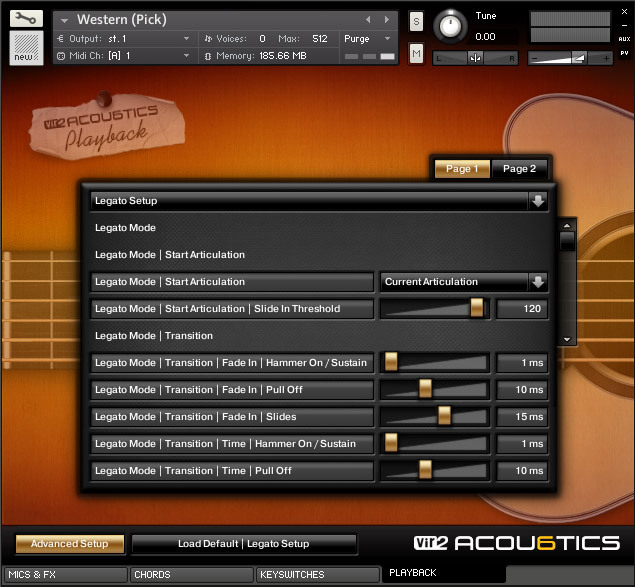 Acou6tics also features virtual room control with adjustable mic distance and sympathetic resonance plus a collection of 156 unique MIDI files of highly-usable strumming patterns. Offering 3/4, 6/8, and 4/4 count patterns, these MIDI files are an excellent tool for discovering a starting point for compositions. This is the default screen when a patch is first loaded. 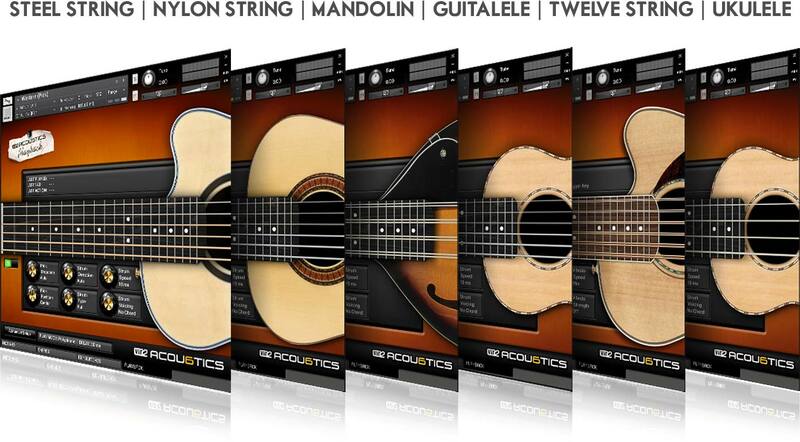 The knobs here adjust essential playback controls for picking, strumming, string selection, volume and vibrato. The advanced menu gives you access to all of the deepest parameters of Acou6tics. 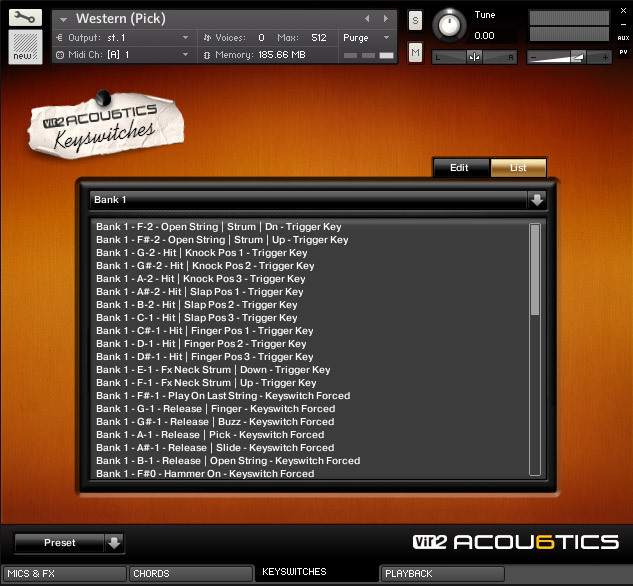 The Keyswitch Edit page allows all keyswitchs and trigger keys to edited and saved. The keyswitch list shows all assigned keyswitches and trigger keys for the selected bank. 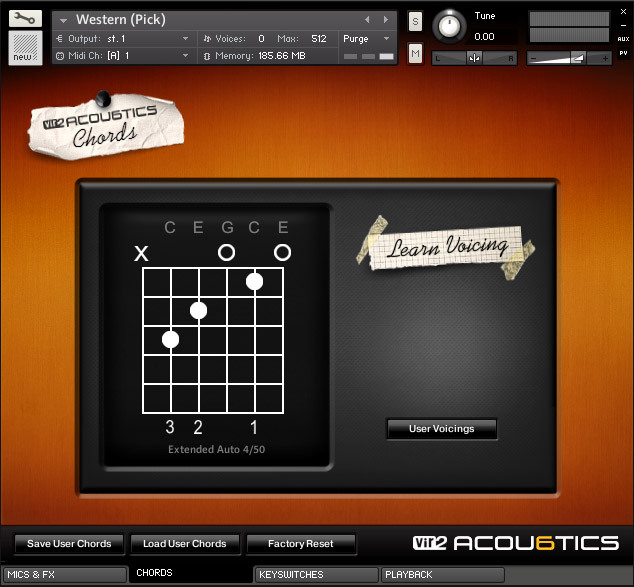 >The Chords page displays the current chord voicing and also allows you to create custom chord voicings. 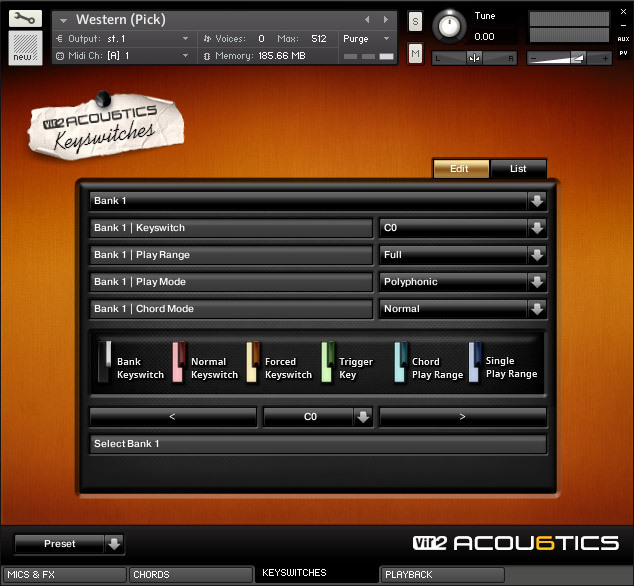 The Mic 1 + Mic 2 page allows you to disable and enble Mic 1 and 2, control their volume and panning, and apply effects. The Piezo page allows you to enable and disable the Piezo pickup and apply effects. 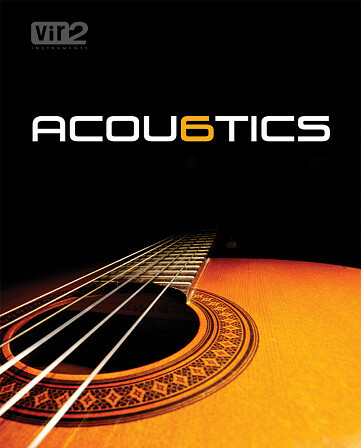 Vir2 Instruments is proud to provide users of Acou6tics with a collection of 156 unique MIDI files of highly?-usable strumming patterns. 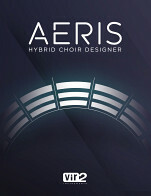 Offering 3/4, 6/8, and 4/4 count patterns, these MIDI files are an excellent tool for discovering a starting point for compositions. For a behind the scenes look at the making of Acou6tics, click here. chords in real time. Most guitar chords are available in up to fifty different voicings. 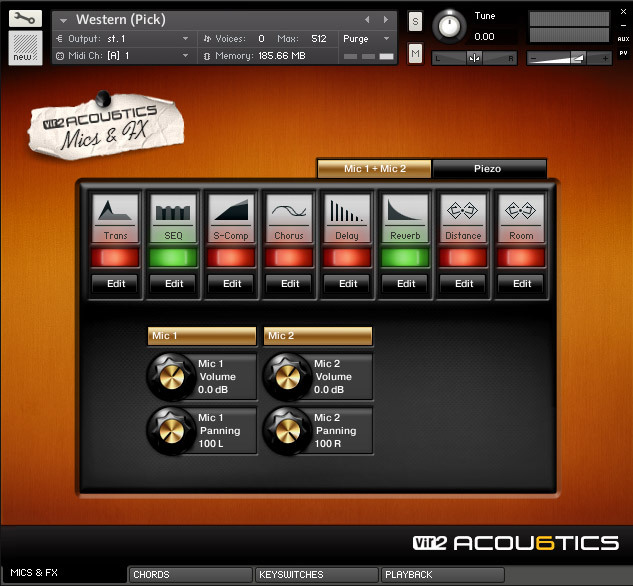 Acou6tics is compatible with both Macintosh and Windows platforms and includes the standalone Kontakt Player 5 application as well as AudioUnit, VST, RTAS (Pro Tools 9 & 10), and AAX (Pro Tools 10 & 11) plug-ins. All of these versions ship in the same box. The Macintosh version requires an Intel Core Duo, 2GB of RAM, and OSX 10.7.3 or later. For optimum performance, Vir2 Instruments recommends a 2.0GHz processor or faster. The library requires 13GB of free hard drive space. The Windows version requires Windows 7 or 8 (latest Service Pac, 32/64 Bit) Intel Core Duo, and 2GB of RAM. 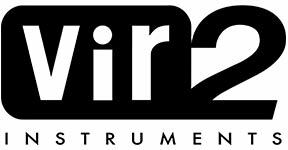 For optimum performance, Vir2 Instruments recommends a 2.0GHz processor or faster. The library requires 13GB of free hard drive space. 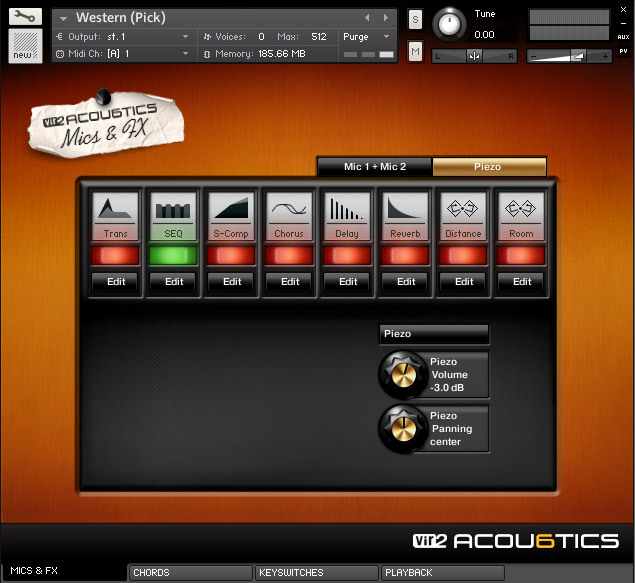 Acou6tics will run in standalone mode and is also compatible with every major sequencing package in the world, including but not limited to: Apple Logic and GarageBand, MOTU Digital Performer, Digidesign Pro Tools (9 and higher), Steinberg Cubase and Nuendo, Ableton Live, and more. The Following End User License Agreement is included with Acou6tics. This License is only valid for the individual who has purchased an unopened, new and lawfully made copy of Acou6tics from a dealer or distributor authorized by Big Fish Audio. All these videos can be found in a special Acou6tics playlist on YouTube.